An active participant in the FFS & ACP Business House Tournament, Susana believes the promotion of equal opportunities in football is instrumental in increasing womens participation. “We need to promote the fact that football is not only for men but also women. The execution of more tournaments with mixed teams like the Business House Tournament would help encourage gender equality, especially if the requirements are altered to include the same number of female players as men”, says the gracious beauty. It was the Business House Tournament which lured the Miss Samoa pageant winner to the game, opting in to fulfil the minimum requirement of 2 female players per team. It was also a chance for her to wind down with her Audit Office colleagues after a hard day’s work. “I enjoy football because it really does help me break a sweat and have a good time while I’m at it with my work colleagues”. The development of womens football in Samoa was slow at first as there were no programs in place from the grassroots level to develop the skills of young Samoan girls. As a result, FFS introduced the “Soccer Sisters” Festivals to increase awareness of womens football and identify skilled players for further development. Structured competitions were also implemented to sustain young girls participation and to prepare them to compete at a senior and international level later down the track. The movement not only involved developing the skills of players but also coaches and referees with courses scheduled throughout the year to increase their knowledge and qualifications. 25 year old Maria Akenese Salamasina is no stranger to calling the shots, having been selected as a FIFA International Women Assistant Referee twice. 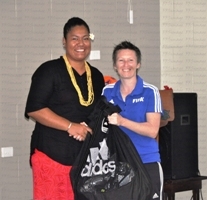 This year, she was the only female in Samoa selected to become a FIFA referee, enabling her to officiate a mens premier league game and any football game within the Oceania region. The idea of football being “a man’s game” is becoming a thing of the past with gender equality at the forefront of the womens football movement. Miss Samoa urges young women to get involved, irrespective of gender barriers. “Never let anyone stop you from achieving what you want and from living that dream, just because of your gender. If you are interested in playing football, GO FOR IT! The sky is the limit and nobody can stop you but yourself”.